Translation: Greek for "tendon lizard"
Tenontosaurus was most interesting for its unusually long tail, which was suspended off the ground by a network of specialized tendons (hence this dinosaur's name). Tenontosaurus was discovered in 1903 during an American Museum of Natural History expedition to Montana led by the famous paleontologist, Barnum Brown. 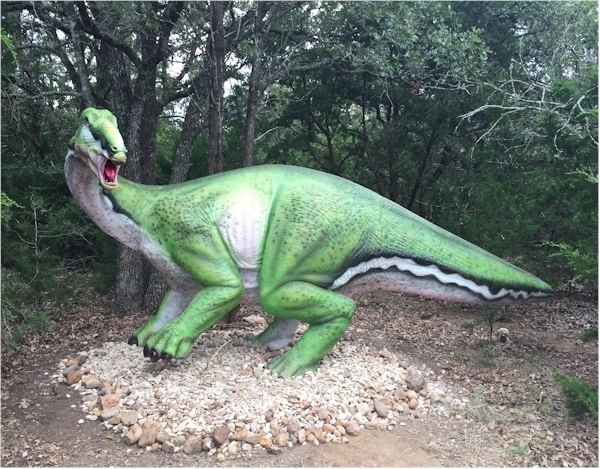 As a dinosaur, Tenontosaurus was once grouped in a class along with the Hypsilphodonts. After that group was restructured, Tenontosaurus is now classified as a primitive Iguanodont. Because of its long forelimbs and strong finger bones, it seems that Tenontosaurus was primarily quadrupedal. It is however likely that the long tail woud have worked as an effective counterbalance, allowing Tenontosaurus to rear up on its hind legs to reach a greater range of plant material that would have been out of reach for other low browsers.